Putin's visit to Serbia: The Czar, The "Pasha" and... space! Putin’s visit to Serbia: The Czar, The “Pasha” and… space! The reception of Russian President Vladimir Putin in Belgrade last Thursday had something from Nikita Mihalkov’s film “The Siberian Barber” and the “spontaneous” popular Milosevic regime’s rallies in the 1990s, in the last century. The bells of all temples in Belgrade sounded joyful as the Russian czar stepped on the red carpet that had been spread out in front of the “Palace”, the government building in the new Belgrade. At the same time, the cannons that had been set up at the opposite side, in honour of Putin, thundered – seven times – at the moment when the national hymns of the two countries were being played by the band of the armed forces. At the other end of the city, provincial buses were arriving one after another, carrying citizens who arrived in the capital to welcome the Russian leader. The traffic police led them to the city center where they were parked along the “Alexandre Vassileos” boulevard. Travelers weary and disoriented swarmed the streets looking for a way to reach the Democracy Square from where the march to the church of Saint Savva would begin. 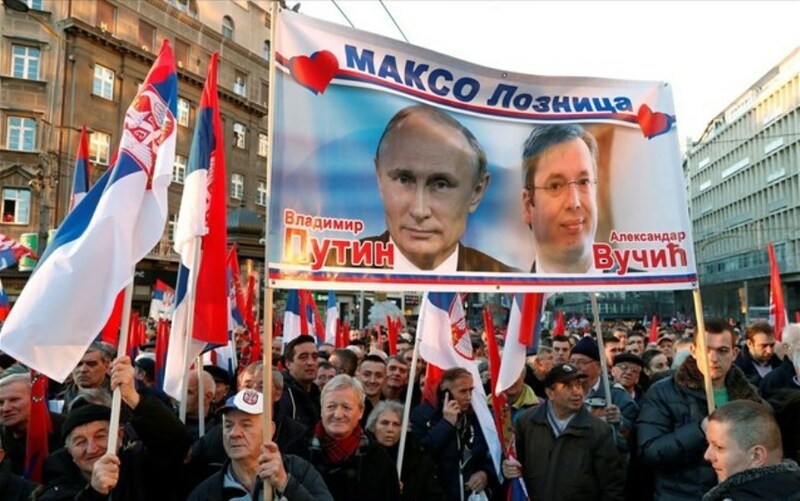 From there, organized and coordinated, with the henchmen of the ruling Serb Progressive Party – SNS as frontmen, they began to welcome Putin. On the way they chanted slogans in favour of Vucic and Putin and against the opposition leader Dragan Djilas. The sun had began to set when they arrived in front of the Church. The march made some of them hungry and they unrolled the sandwiches provided by the organizers. At the same time, in the Palace, Putin commemorated Vucic and he gave him a puppy that accidentally or not responds to the name “Pasha”. Next came the signatures for various agreements by the ministers. There was even the signing of an agreement for space cooperation. Serbian political leadership has created the impression to the world that the Russians have brought gifts, while they actually received a few hundreds of millions of euro from the economic agreements they signed. It is, of course, legitimate to give certain infrastructure projects, such as the reconstruction of the railway network and the expansion of gas storage facilities, on the basis of political criteria, provided that this option does not cost the citizens much more than another. As analyst Veselin Simonovic writes in the newspaper Blic, this was the case with the six MIG-29 aircraft that Russia “donated” to Serbia, but the modernization of which costs more than buying new ones. Even Putin’s promise for Serbia’s interconnection with the Turkish Stream pipeline was general and vague, since as he said it would be realized if the need for the project was expressed by the countries of the European Union. At a political level, there was no pompous statement justifying the enthusiasm of the pro-government press. For Kosovo, Putin reiterated what Russia has been saying for years, that it would support every choice made by Serbia. No dynamic intervention, no initiative, while there was the impression that Russia serves to keep the issue open. According to the assessment of independent media analysts in Serbia, if the issue is resolved by a compromise and there is mutual recognition between Serbia and Kosovo, the next day Kosovo will join NATO. On the other hand, Serbia would have no more political ground to remain faithful to Russia. It is in Moscow’s interest to maintain the “frozen conflict” in Kosovo, with the same logic that it wants and the lack of solution in the nomenclature between Greece and fYROMacedonia. Russia is applying on the Kosovo issue the same tactic it applied on the Macedonian one, using various “patriotic” organizations and the Serbian Orthodox Church to promote a lack of solution to the issue of Kosovo. The scene of Putin’s Imperial Host Ceremony would be poor if the Serb Church hierarchy did not participate. Putin’s visit to the temple of Saint Savva, the largest orthodox temple in the world, was an impressive event. The 49 bells of the temple announced the coming of the Russian leader. The Patriarch of the Serbs, Irenaeus, and tens of thousands of citizens welcomed him by chanting his name. After lighting a candle in the Temple and listening to the ecclesiastical choir, Putin inspected the illustration with mosaics that are financed by Russia. He was so impressed that he offered another five million euro to continue the works. In recent years, Moscow has been trying in various ways to remove the Serbian Church from the Ecumenical Patriarchate and place it under the influence of the Russian. The donations, the approach of hierarchs of the two Churches and the propaganda from various media affect the public opinion in Serbia. Some hierarchs systematically and methodically create a negative image of the Patriarchate at Phanar, and its universalism is increasingly questioned. Indeed, after the autocephaly was granted to the Ukrainian Orthodox Church, the voices inside the Church are seeking the approach to Moscow. Political observers believe that Russia’s intention is to gain absolute control over the ecclesiastical hierarchy in Serbia to be able to influence geopolitical developments. Some analysts even believe that even the intransigent stance of the Serbian Church to the issue of Kosovo, in which it is against any compromise, but seeks to maintain the “frozen conflict” situation with the Albanians, is the result of the Russian influence.